There's plenty I should be saying and catching up on today, but sinus issues had me working in slow motion all week. That worked perfectly with this week's Year of Jewelry Project topic, "Off the Cuff." Initially I figured I would do a bracelet, playing off the 'cuff' of the topic. However, as the end of the week began to loom upon me, I realized that I didn't have the time or energy to learn a new skill. It works out though since the definition of Off the Cuff is "to ad-lib with little or no preparation or forethought." HA! 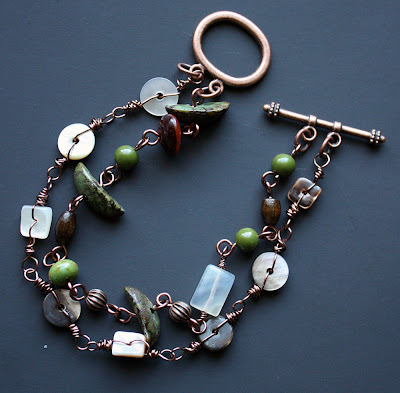 As this was the case, I grabbed my bowl of miscellaneous beads (leftovers from other projects), picked out some beads that seemed to blend well together, and threw this bracelet together. It makes me happy to know I got SOMETHING accomplished this week. This Year of Jewelry thing is really helping me push myself to get at least one item made each week and that's great. You can see more of the projects for this week's topic in the Off the Cuff facebook album. The flow and vibe and colors are great on this one! Hope you are feeling better soon! What a fun bracelet! 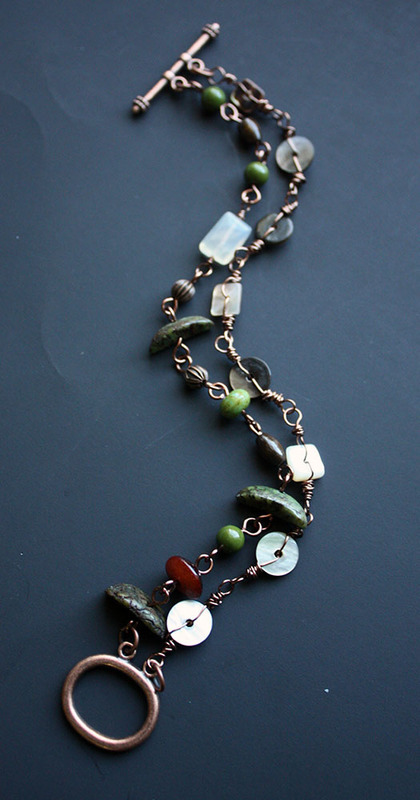 I love the mix of beads and the wirework is awesome! I really like the style of this bracelet. Would go with lots of outfits and has lots of visual interest. This turned out to be beautiful, and I'm doubly impressed due to your sinus problems. When sinuses aren't well, nothing is right! I LOVE your bracelet...er...cuff! These might have been workbench beads, but they look oh-so-carefully curated and perfectly placed. Great wirework and fantastic use of lights and darks!! Hope- Yeah, I slept almost all day Wednesday and was moving pretty slow on Thursday, but by Thursday night (as our overcast skies began to lift) the clouds began to part in my sinuses too. Thank goodness!! I appreciate you stopping by! Coffee- Thanks so much! I'm so happy it came together too. Karin- Thank you SO MUCH!! While I said they were just leftover beads, I did sort through my little bowl a while looking for just the right beads. I'm pleased that they did work out so well. I appreciate your excitement about it.